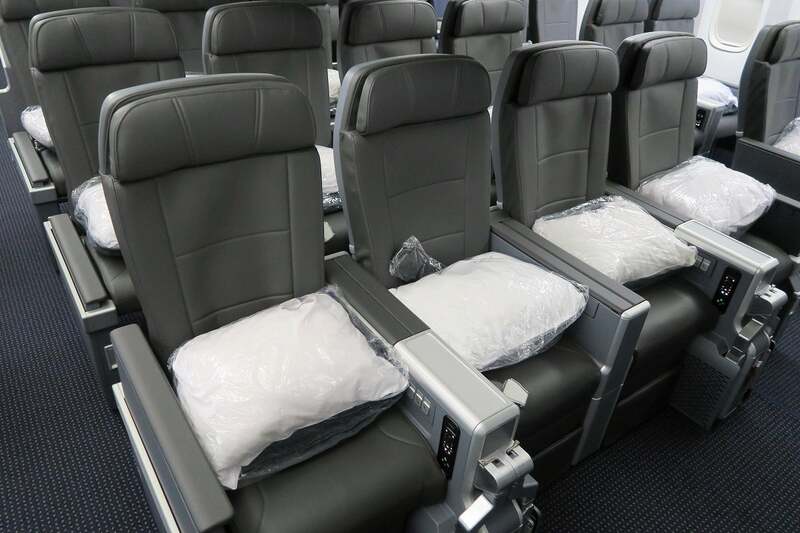 AA is aggressively rolling out premium economy seats on its long-haul aircraft. 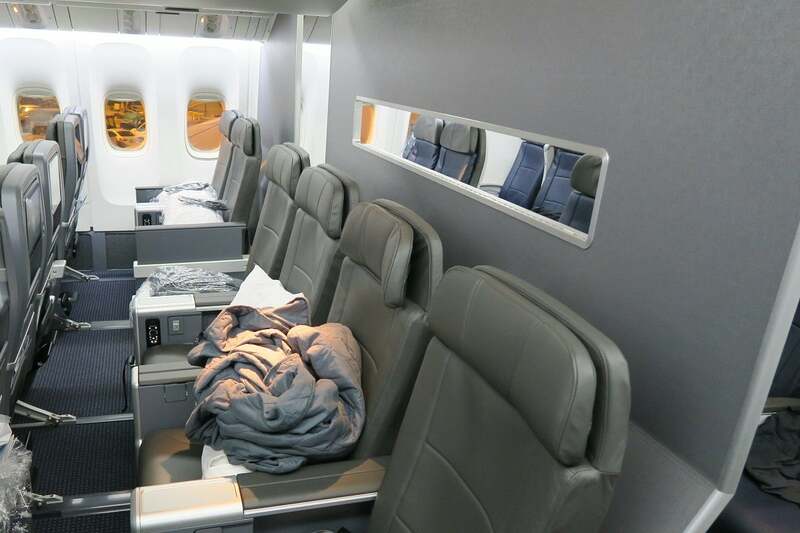 The Pros: more legroom, wider seats, footrests, surprisingly good pillows and comforters. The Cons: four-wide seating in the middle, odd power plug placement and snug bulkhead seats. 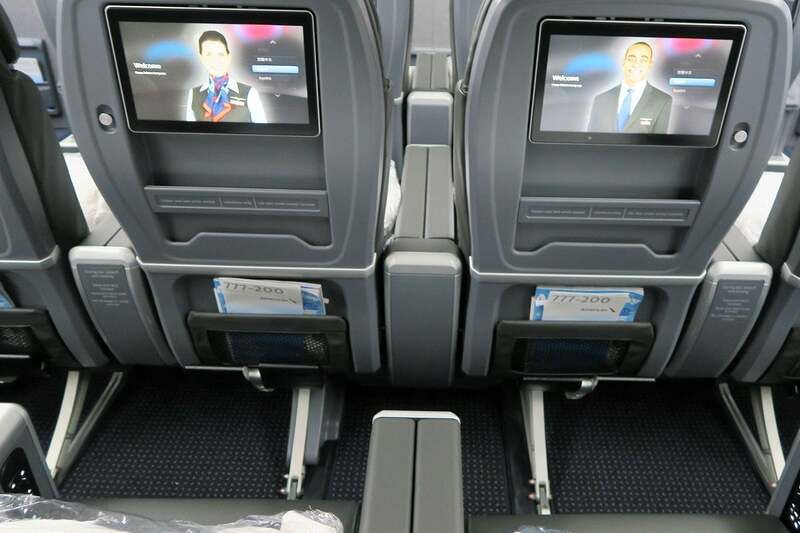 American Airlines is in the midst of a premium economy overhaul. Starting with the first delivery of AA’s new Boeing 787-9 in October 2016, each of these new aircraft have been delivered with premium economy seats. 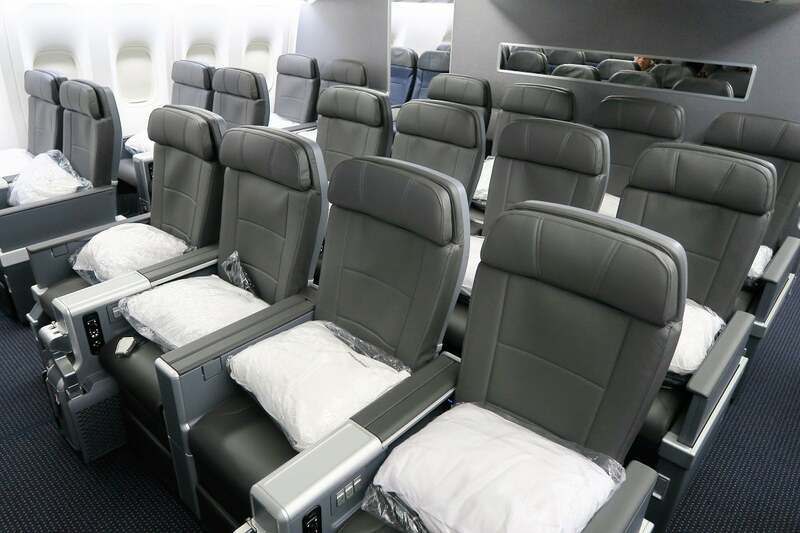 After rolling out a soft launch of premium economy service from October 2016 through April 2017, AA finally launched premium economy as a separate class of service on May 4. 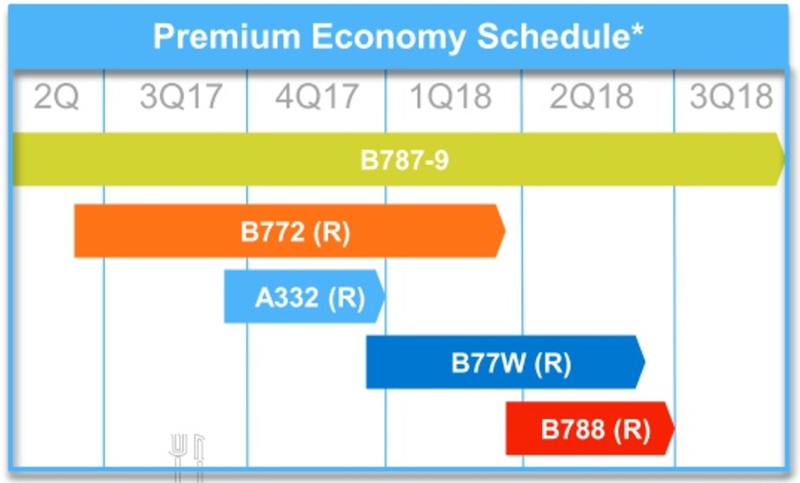 Now, AA is turning its attention to retrofitting its current aircraft with premium economy seats, with the aggressive goal of having all 777s, A330s and 787s finished by June 2018. First up: the Boeing 777-200. And the first of those 777-200s to be retrofit: tail number N781AN (internal code: 7AM). After a few weeks in the Everett, Washington, shop, this aircraft was ferried back to Dallas/Fort Worth (DFW) last Thursday. 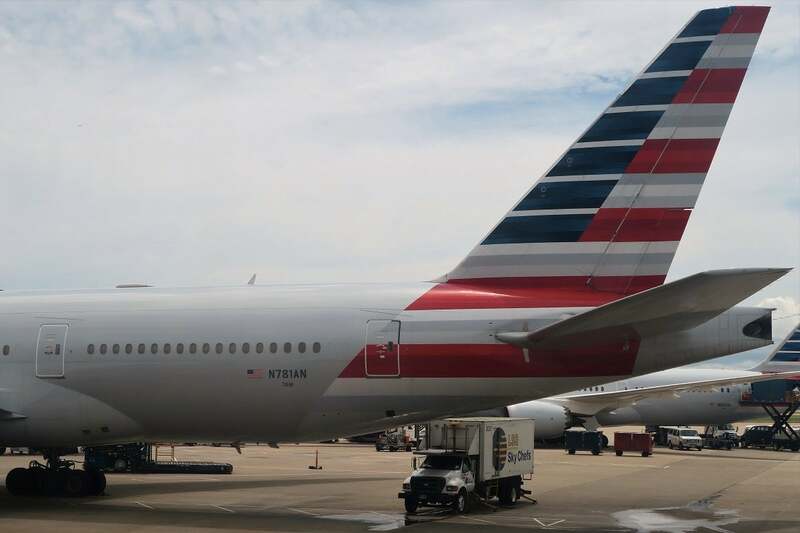 AA had originally scheduled this aircraft for a pair of flights to/from Frankfurt (FRA) on Friday/Saturday, but the plane was swapped out at the last minute, meaning the “inaugural” flight (since being reconfigured) would be AA #1425 from Dallas/Fort Worth (DFW) to Miami (MIA) on Saturday. It was a true last-minute trip, but I was able to make it aboard for an inside look. Just my luck, flight #1425 was available to book with miles, so on Friday, I grabbed an award flight from Austin (AUS) to MIA via DFW for just 12,500 American Airlines AAdvantage miles and $5.60 in taxes and fees, which I put on my Citi Prestige because of its trip delay protection. The revenue cost of the same flight would have been $398 one-way, making this redemption worth 3.14 cents per mile. Immediately after booking — before I even received the reservation confirmation — I got an email from American Airlines saying my upgrade had cleared on the flight from DFW-MIA. While always a pleasant email to receive, I wasn’t surprised. Ever since AA changed its process to allow for upgrades on award tickets, I’ve been upgraded on five out of the six award flights I’ve booked. 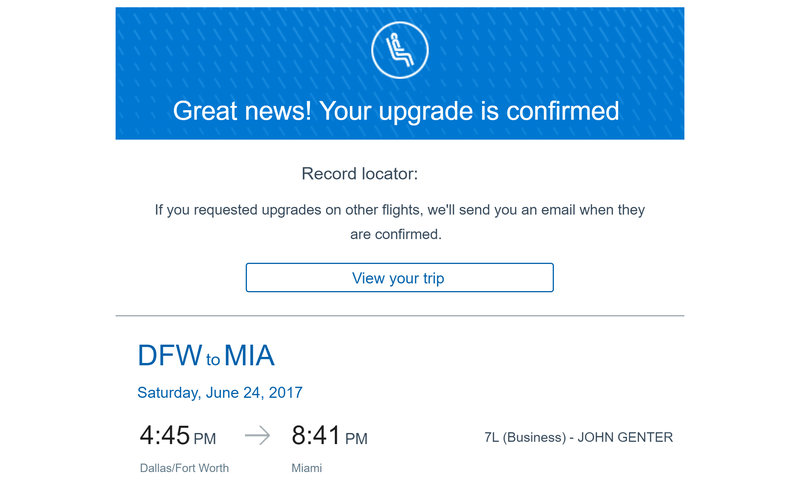 The only “missed” upgrade was on an award that I cancelled a few days out — if I’d kept it, I may have been upgraded on that one, too. 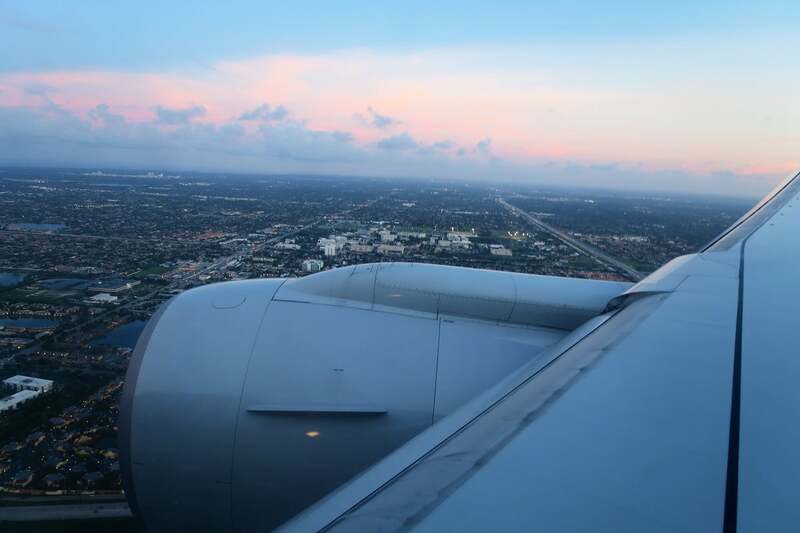 While a lie-flat business class seat, hot meal and better beverages sounded appealing — if even for a couple of hours — I really wanted to experience the premium economy seat on this flight. However, even with an AA employee’s assistance, we weren’t able to convince the busy gate AAgents to shuffle the seats — i.e. downgrade me to premium economy and upgrade someone else to business — so I had to do it myself. Although befuddled as to why someone would want to voluntarily downgrade themselves, the flight attendants were fine with me switching with a passenger who had been assigned to a premium economy seat, and although they had no method of switching us in the system, they said we could simply sit in each other’s seats. The premium economy cabin on the 777-200 is arranged in three rows in a 2-4-2 configuration. 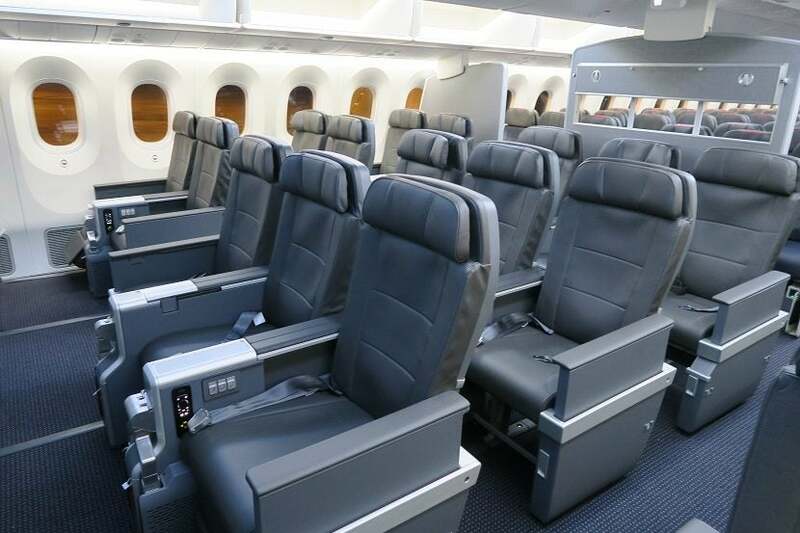 This eight-wide seating compares nicely with the tight 10-wide seating you’ll find in economy (in a 3-4-3 layout) — allowing an extra few inches of seat width. 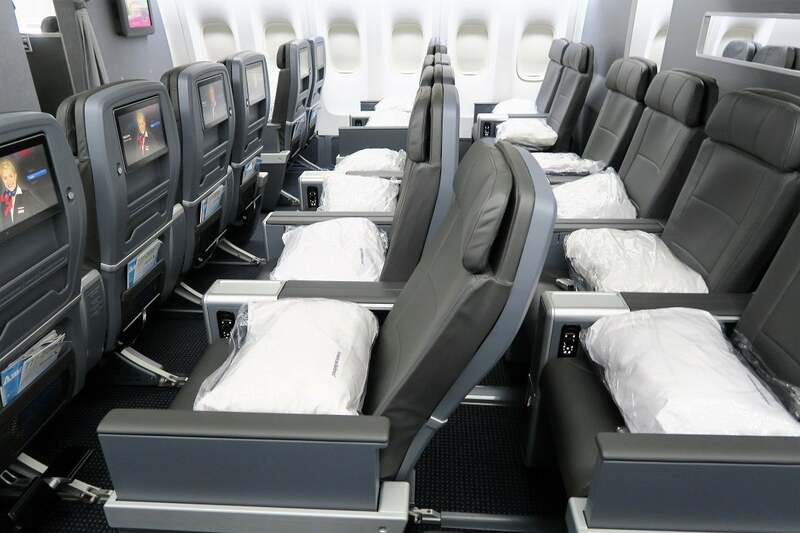 Note that this eight-wide arrangement means these seats have the same width you’ll find on some of United’s 777-200s in business class. The pairs of two seats by the window are especially good for couples who like to sit in a row together. However, the four-wide seating in the middle isn’t ideal for anyone but families of four. Those looking for a nice window view will want to stay forward. The bulkhead seat in row 13 is located just behind the leading edge of the wing, giving you the best view of any seat in the cabin — although it’s still a bit limited. Each window seat in premium economy also has two windows and there are no missing windows in this cabin. There’s a curtain and a roughly five-foot bulkhead wall separating the premium economy cabin from the business-class cabin. While there’s also a floor-to-ceiling bulkhead wall between premium economy and economy, complete with a window that closes for safety purposes, there’s no curtain or rigging for a curtain in the aisles. 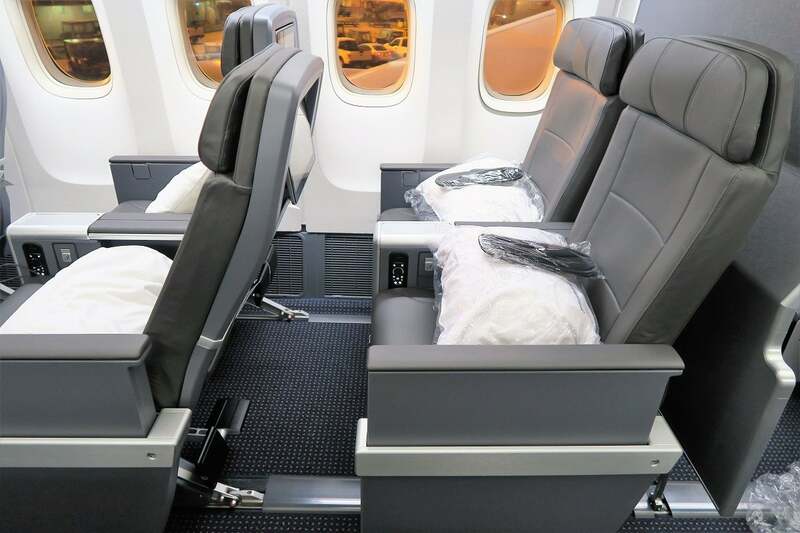 While you’ll find widely varying business-class products on American Airlines’ aircraft, the carrier has been pretty consistent so far with its premium economy seating. 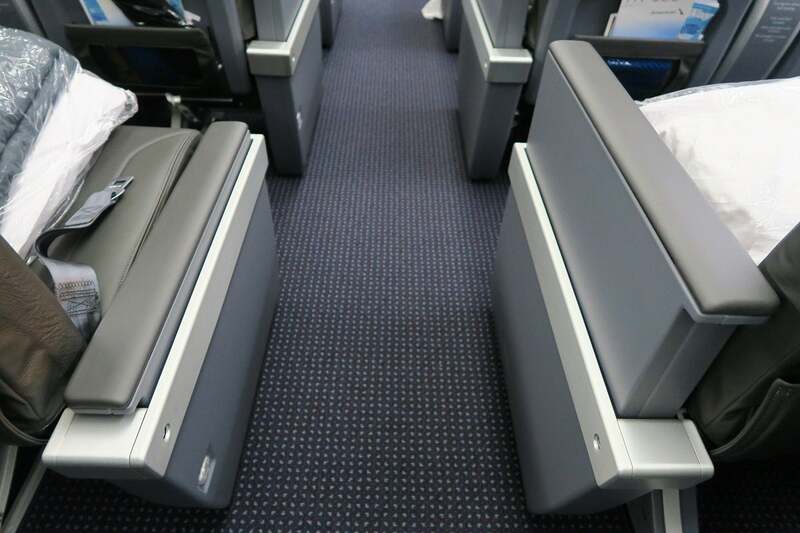 From everything I could see, these were identical to the premium economy seats on the 787-9, with the only real difference being the how many there were (2-3-2 vs. 2-4-2). For reference, here’s a look at the Boeing 787-9 premium economy cabin. On the 777-200, these premium economy seats have 38 inches of pitch, and while they do recline a bit, it’s a bit underwhelming. The seats measure about 19 inches between armrests, which isn’t great but sure beats the 17-inch width you’ll get in economy. 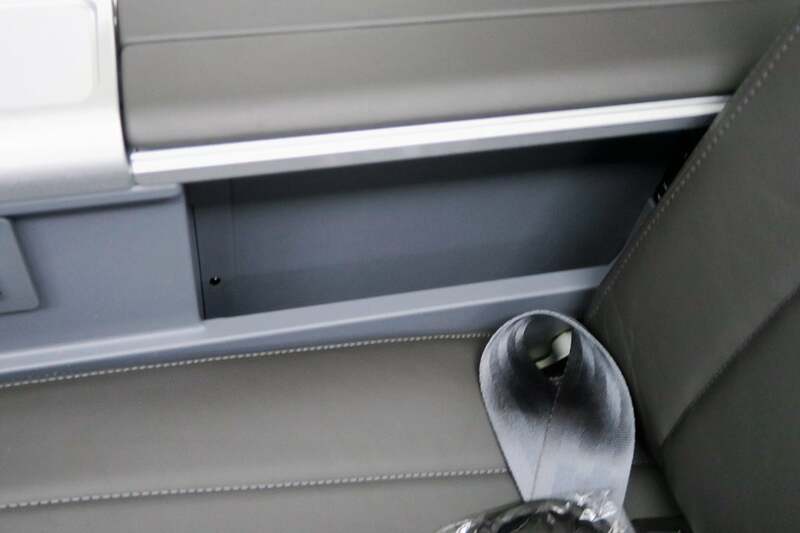 There’s a small storage well in the armrest between seats, which is better used for holding your cell phone, boarding pass or any other small items. I was able to fit my 0.7″-thick laptop here during takeoff and landing. 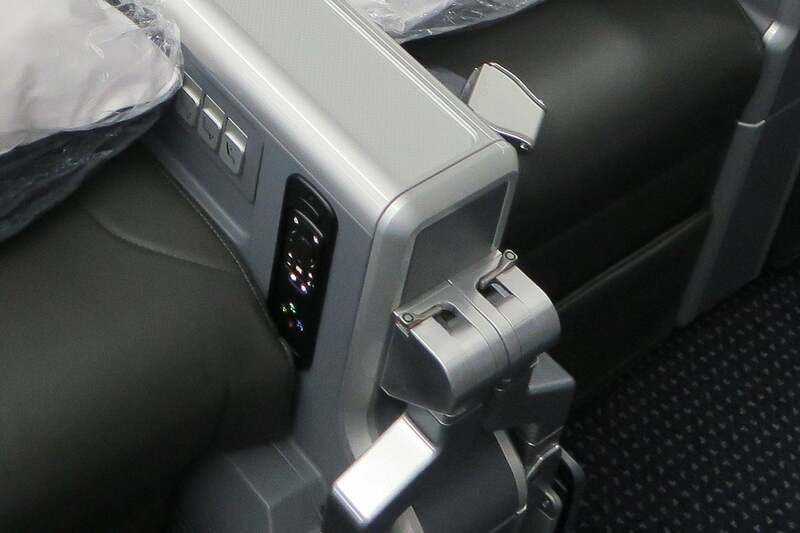 Rows 14-15 also have a storage tray and seat-back pocket beneath the in-flight entertainment screen. Each seat has a tray table that is stored in an armrest. When you pull the lever, the table releases upward, but you still need to pull it fully out before it can fold outward. 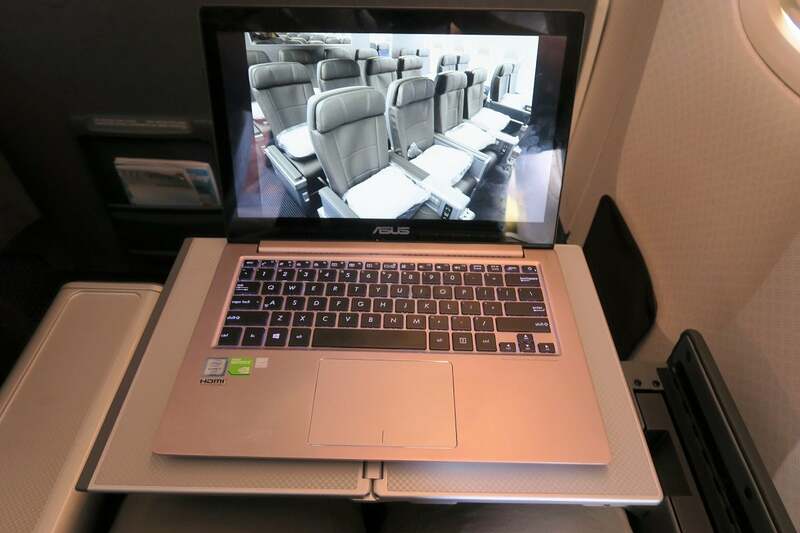 When fully extended, the tray table measures 16 inches wide by 10.5 inches deep, which gives you plenty of space for a laptop, but not much else. Although the table isn’t supported by the opposite armrest, it’s quite steady. 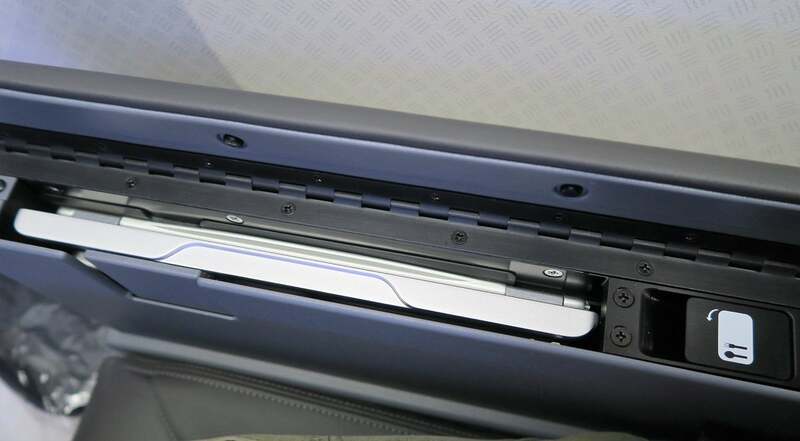 The tray table also adjusts forward about five inches, giving you some room to breathe. The armrests on the aisle can be lowered, a feature that’s designed to help those with limited mobility but can also be a useful way of gaining some extra space if the 19-inch seat width starts feeling a little cramped. However, I wasn’t able to figure out the mechanism that lowers this armrest. It doesn’t seem that the armrests between the two middle seats can be retracted either. Each seat comes with a footrest, while those in the bulkhead (row 13) have a retractable leg rest and a retractable footrest. At 5’11” tall, I didn’t find the bulkhead to be very comfortable with the leg rest in place. While the leg rest supported my legs, it also pushed my feet into the bulkhead wall. I understand, though, that shorter passengers would especially appreciate them. Seats in the other two rows (14-15) have a footrest that folds down from the seat in front. In the middle seats, the supports are a bit awkward since they split the under-the-seat areas for four seats into five sections. 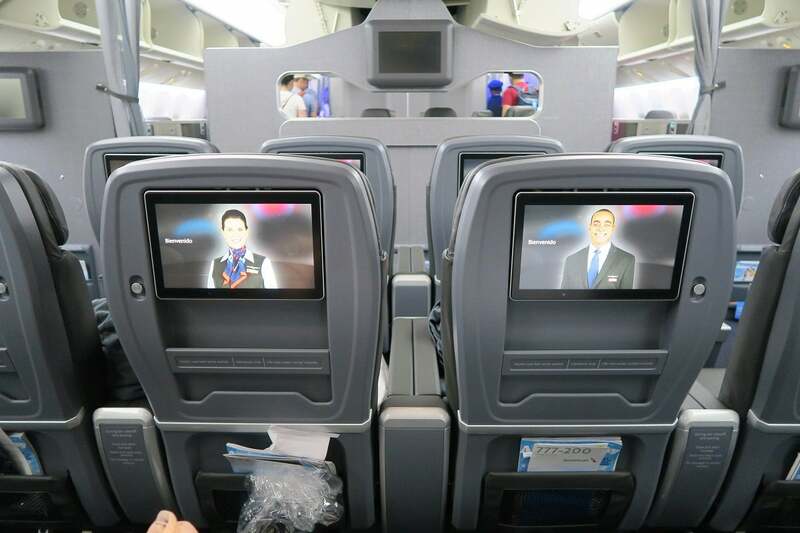 Each seat comes with a 11.5-inch IFE touchscreen — in rows 14 and 15, the screen is built right into the seat in front of you — and they tilt so you can still see clearly when the seat in front is reclined. The bulkhead row has its IFE screens tucked away between the seats. I’m not sure if it’s because these seats are so new or if this will be a lasting problem, but I found that you have to press very hard on the IFE release lever (marked by a green circle) to get the screen to pop up. 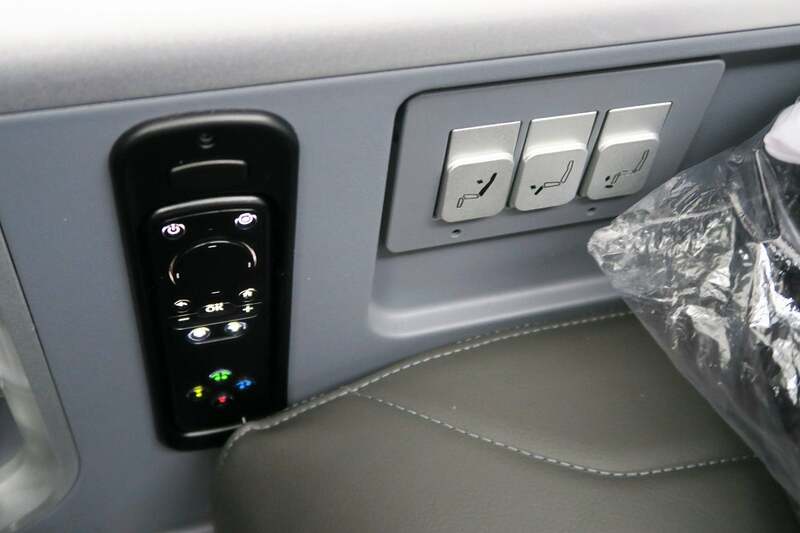 The remote is stored in the side of the middle armrest near your thigh. Unfortunately, this placement means you can accidentally hit the exposed buttons with your leg. 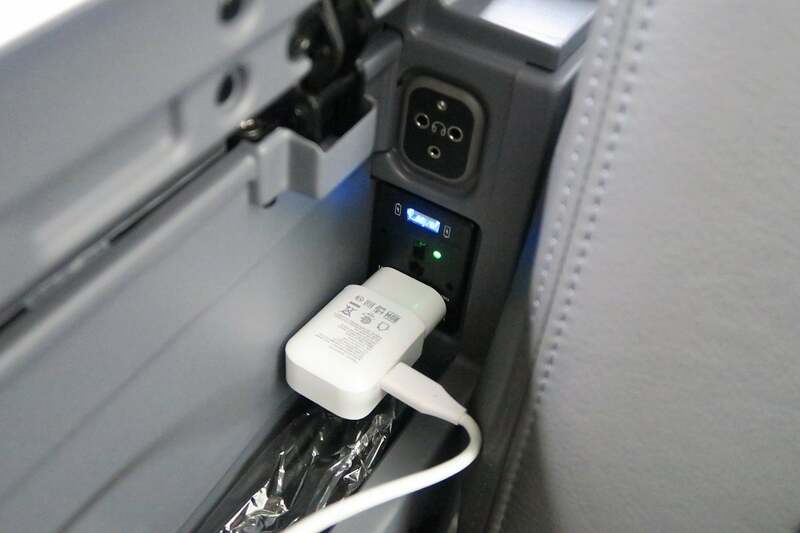 You’ll find a universal power outlet and USB power plug in the small storage well between the seats. As with the power plug on the 787-9, the placement is less than ideal if you’ve got a plug like mine. Any adapter with a cord that extends at a 90° angle from the socket is going to have trouble plugging in. I noticed that mine did a lot better in the aisle seat (pictured below) than with my window seat, where I was unable to use it at all. On this short flight from DFW-MIA, there shouldn’t have been any amenities in the economy cabin, but it seems AA had stocked this aircraft in anticipation of using it on the flight to Frankfurt (FRA). 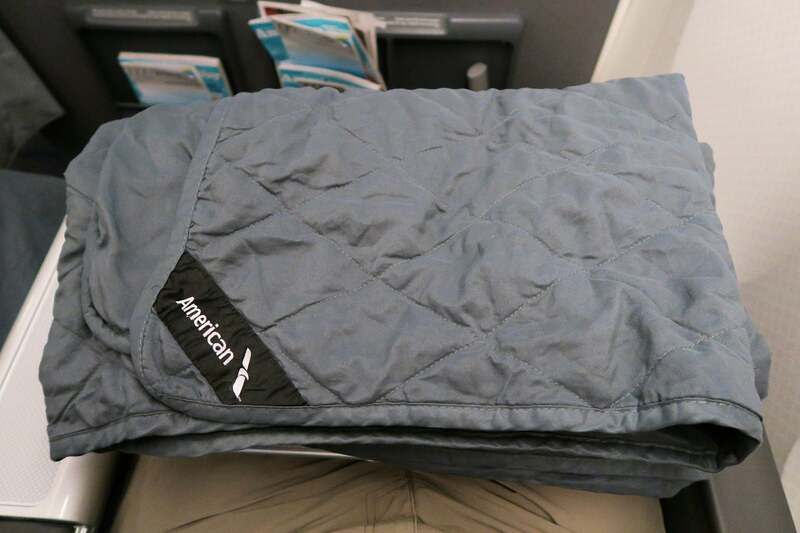 As a result, economy seats came with a pillow and blanket and I got a taste of what passengers sitting in these premium economy seats can expect to see on international flights — a thick pillow and heavy-duty comforter, both of which were surprisingly good for premium economy. In addition to the pillow and comforter, AA should also be stocking an amenity kit and over-the-ear “noise-reducing” headphones. I asked the flight attendants for more info, but these items weren’t available on this trip. The two-prong plug for the headphones can be found in the storage well above the power plugs. Remember to bring an adapter along if you want to use your own headphones. This plane is equipped with Panasonic satellite-based Wi-Fi. The pricing options were reasonable but better suited for an international flight than this short hop from DFW-MIA: $12 for two hours, $17 for four hours and $19 for the duration of the flight. While I’ve had good experiences with Panasonic on past long-haul flights, the Wi-Fi on this flight was too slow for me to even run a speed test. Critical parts of premium economy are dependent on service, food and drink options and additional amenities, which were absent on this domestic flight, so I can’t give a full verdict this product just yet. However, based on the experience I had, the seats and amenities stocked on this flight make a good case. 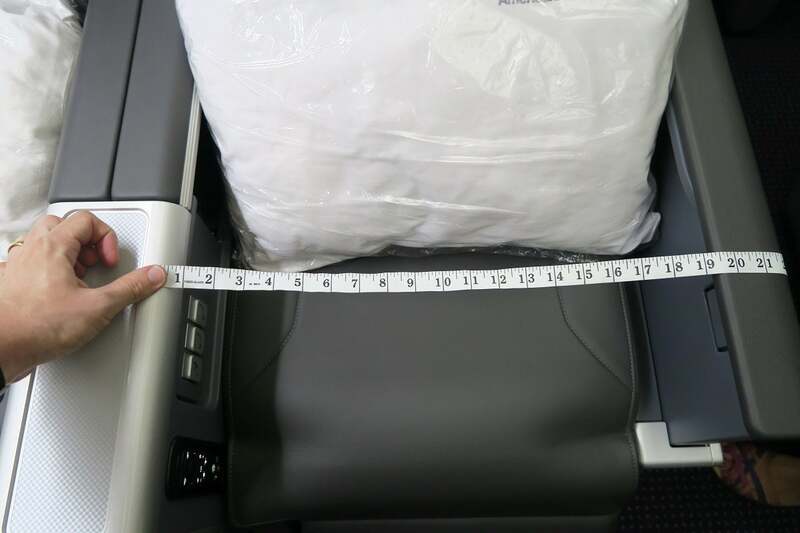 For big and tall passengers, the cramped 17-inch wide by 31-inch pitch economy seats on the 777-200 just don’t cut it, making premium economy worth the upgrade. While 19-inches by 38-inches isn’t especially spacious, the extra room can make your flight much more pleasant. Based on this experience, I’ll be looking for premium economy on this aircraft for future flights. 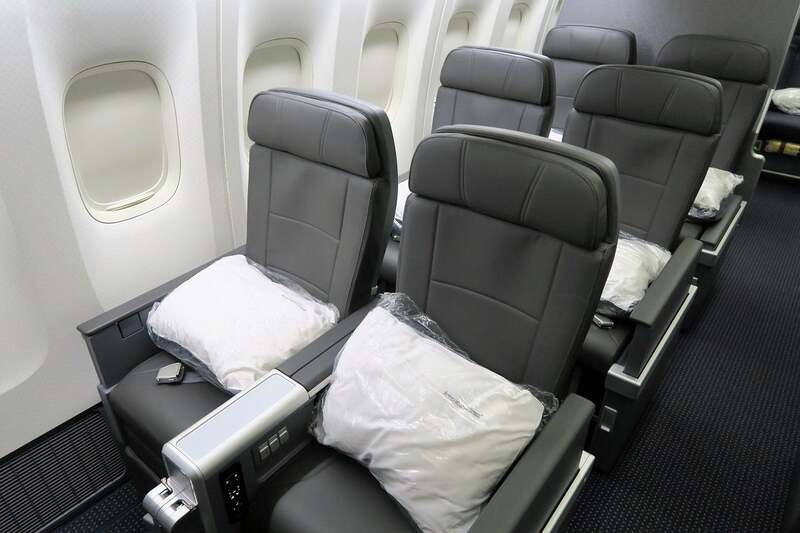 Best of all, these seats (and service on international flights) are classified as Main Cabin Extra until the premium economy class of service officially begins on the 777 starting December 15. 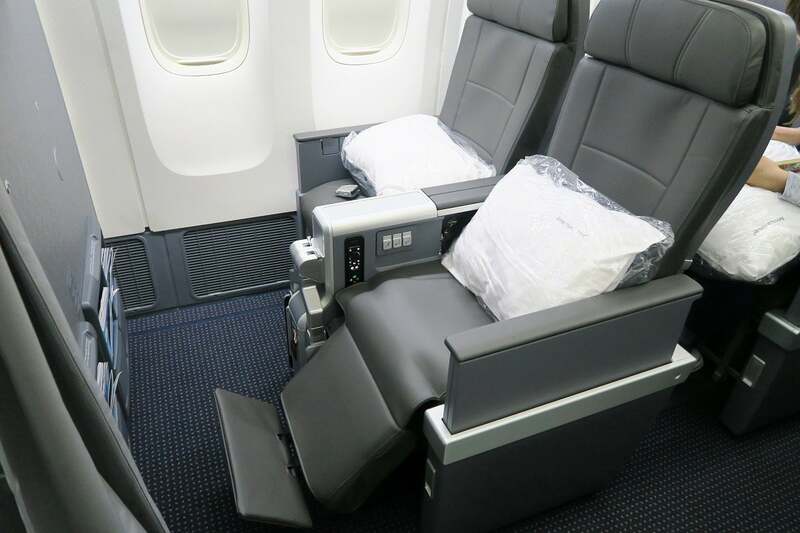 Have you flown in premium economy aboard AA’s 777-200? Tell us about your experience, below.